At a kitchen table in Kansas, new found friends asked me if I knew a Kansas artists who paints moths. I instantly knew it was John Cody. John Cody was a traditional watercolor artist. 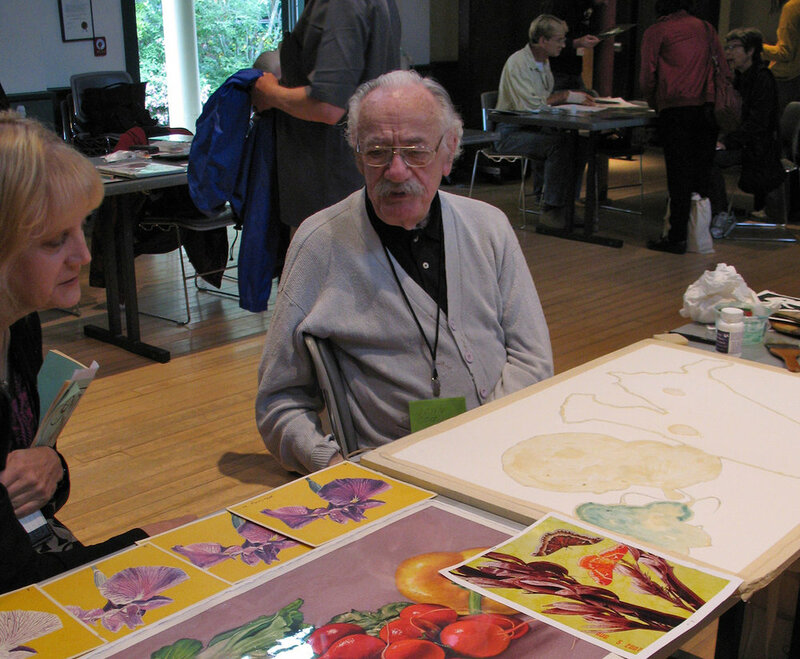 I got to know him as the programs coordinator for the Guild of Natural Science Illustrators Conference in 2011. He did not have an email. I would call him about his workshop and snail mailed forms. I would have sent him a messenger pigeon if necessary. John Cody was the silver haired mustachioed magus of the Guild. He was old school. If he called I picked up, even in the lobby of the Brooklyn Museum, where he told me how he was born and raised in Brooklyn. "People", he said "wondered why he moved to Hayes, Kansas, since there is nothing to do there". His answer, "Exactly. There are no distractions". John was kind, keenly intelligent and funny. At a GNSI conference a couple years ago he told a friend, "Well, I'm just glad to be here because most men my age are dead!" I miss his stories. Such as watching rights of manhood in rural Africa, where young men would leap over and stick their heads briefly in a fire. Listening to him talk was magical. He sent me two letters, but I couldn't read his handwriting. I kept saying, I'll translate this into text and then send a proper letter in the meantime I gave a small timid reply. I was fortunate enough to take his workshop. Even better than learning his techniques was hearing how he over came daily resistance. How he would putter around for an hour before starting to work and then be so engrossed his wife Dot would have to call him to lunch. How he worked the heavily intricate Saturnid Moths one masked inch at a time saying that it was too overwhelming to look at the whole picture. How it was Dot that encourage him to fully pursue art after he retired. I waited too long to write my letter. John Cody died July 11th 2016. It is a great regret that I didn't spend more time with him. That I let myself self consciousness get in the way of corresponding with this amazing human being before it was too late. They say one should never meet your heroes. I disagree there is much we can learn from a hero. and it's important we tell them how much they mean to us. John's moth paintings are master works, but true to the GNSI mentality he was happy to share all of his secrets with other artists. From him I learned to apply Frisket with a yarn needle stuck in a cork. Doesn't sound like much but it was brilliant. Frisket is a masking fluid like rubber cement used to mask clean sections of a watercolor to be painted later. Frisket would trash any brush it touched. Before, I would waste at least 10 toothpicks trying to get a intricate border, but frisket cleans easily off a metal needle eye. For his smooth atmosphere gradient washes, first take a 22 X 30" paper taped to an art board, and elevate the top edge of the board four inches above drawing table Second, apply a thin water wash with a 2" Hake brush in bands from left to right beginning at the top, slowly stroking horizontally. Blot any excess gently with a paper towel. Third, apply a very pale wash the same way, then dry completely with a hair dryer. Fourth, start with two bands of clear water, the third band will be a pale wash of color continuing to the bottom allowing the capillary attraction to draw the paint up, creating a subtle gradient. Fifth, three bands of water, then a slightly more pigmented wash. Dry the layer. Sixth, the following layers always start with a brush width of water and a wash slightly pigmented each time, moving a band at a time down the slope. Each layer is dried before the next. Another technique seen in his paintings was scattering salt on a wet wash to create interesting textures. To honor him I create my own painting using his techniques. It was going to be a simple vegetable still life, but something was missing. It needed some animation, something that would move if it could. I thought of a wooly bear but that didn't have the charisma it needed. Of course it need a moth. There is an interview with John Cody on Youtube to learn more about him. And you can still see and purchase John's amazing works through John Cody Gallery website. The site belongs to his family and sells cards and beautiful limited edition signed prints. The perfect gift for the naturalist in your family or for yourself. GNSI Member's have a special discount for 2017. Check the list serve and member news for more information. Many thanks to John Cody's family, Britt Griswold and Gail Guth for the permissions to use the images for this post.